I’ve made this Salisbury Steak recipe twice in the past few weeks and it’s quickly giving my meatloaf a run for it’s money as the most requested dinner in my house. Even the little guy loves it and eats a whole patty, which is a lot for him. 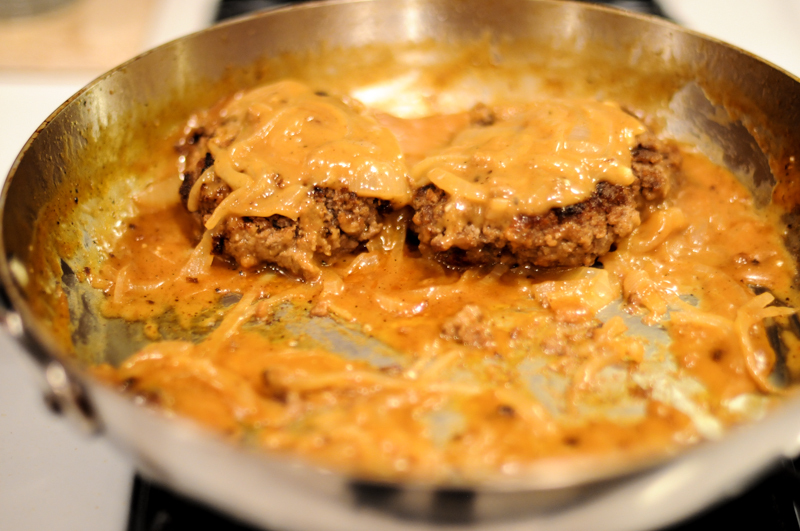 When I first made Salisbury Steak years ago, I didn’t have any mustard powder in the cupboard so I used yellow mustard instead and I’ve never made it any other other way since. I just love the mustard flavor too so sometimes I will add a bit more in. My favorite part is the gravy. It becomes so rich and creamy with the addition of butter and cream right at the end. Serve with a good starch, like mashed potatoes or thick egg noodles on the side to sop up any that is remaining. From start to finish this recipe only takes about a half hour to make, so it’s perfect for a last minute, quick dinner for the middle of the week. Don’t bother washing the pan in between sauteing the onions and frying the patties. You’ll also want to keep some of the bits of browned meat in the bottom after you drain the oil for your gravy. It’s been a long time since I’ve made this and I am glad I brought it back into the rotation. I hope you like it too! In a large saute pan over medium high heat, melt 1 tablespoon of the butter. Add the sliced onion and cook until they are just softened. (The onions will cook more later.) Remove to a bowl and set aside. Don't bother cleaning the pan as you will reuse it. In a large bowl combine the ground beef, breadcrumbs, ¼ cup of ketchup, mustard, 2 teaspoons of Worcestershire sauce, and a few grinds of fresh black pepper. Mix well and shape into 4 oblong patties. Remove the patties to a plate and drain the pan of the oil. Reduce the heat and return the onions to the pan. Add the beef broth minus the 2 tablespoons. Add 1 tablespoon of ketchup and 1 teaspoon of Worcestershire sauce. Mix well. To make the slurry, in a small bowl combine the cornstarch and the reserved beef broth. Mix with a fork until all of the cornstarch is dissolved. Bring the gravy to a boil then add the slurry stirring continuously. Your gravy will thicken quite a bit. Return the beef patties to the pan and coat with the gravy, continuing to cook until heated through. Remove the patties, gravy and onions to a serving platter. Enjoy!